Fred Taylor, columnist of the Nationally Syndicated "Common Sense Antiques"
“He leads the reader through the process of examining a piece of furniture so that it reveals essential clues regarding age and condition. For anyone wanting an easy-reading book to teach them a thing or two about judging the age and makeup of piece of furniture, this title is perfect." ”Although furniture joints and tool marks can make for dry subjects, Taylor treats his readers to an entertaining writing style, plenty of full color and black and white photos, and solid information gained from his years of experience. There is an overview of styles, a full color page showing common wood grains and a helpful section on antique glass and mirrors. As an added plus, the book is published in paperback, keeping the cost down and making it light enough to carry along to antique malls, tag sales and auctions. In short it’s a valuable resource beginning furniture sleuths will find well worth investigating." “Great book. Very informative, easy to read & understand by people who know nothing about antique furniture”. Do you want to learn more about antique and older furniture? Do you wish you had some basic knowledge to identify the real value of that special looking piece of furniture at the yard sale, flea market or antique shop? Fred and Gail Taylor became interested in antique and older furniture when they began restoring their 1928 bungalow in South Tampa, Florida. This eventually led to their full-time involvement in the antique furniture restoration business. Fred Taylor is the author of a syndicated series of monthly columns under the bylines "Common Sense Antiques" and "Questions and Common Sense Answers" for antiques and collectibles publications in the U.S. and Canada. “Common Sense Antiques Volumes I and II”, 60 columns each, have been compiled, edited and updated in two downloadable .pdf files with numerous color photos. Fred also offers a DVD, "Identification of Older & Antique Furniture". It is a natural extension of their efforts and has been very favorably reviewed by such publications as Maine Antique Digest and the Library Journal and is now available on this website. 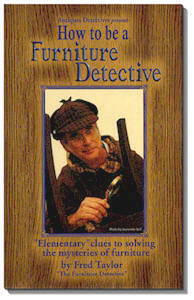 Fred used the DVD as the basis for his book, "How to be a Furniture Detective” which uses the Sherlock Holmes approach to determining the age, style, wood and condition of a piece of furniture. His easy going writing style makes it feel more like a conversation with an old friend than a technical work on furniture although it is loaded with technical and historical information. All of these useful antique furniture products are for sale here. Thanks so much for this interesting and informative article on press back chairs! I just bought a rocker from a garage sale that I thought was probably from the early 1900s, but I wasn't very sure. I knew the "carving" was too perfect to be hand-worked, but it was also obvious by the solid wood seat and other details that it wasn't from the mid-20th century or beyond. Thanks again for the article and helping me solve my "mystery". Mr. Taylor ... Thank you very much for the Furniture Screw article. It was good talking to you and I really appreciate your speedy response to my request.